Heat olive oil and butter in a skillet over medium heat. Stir in garlic and ginger; cook and stir until fragrant, about 3 minutes. Stir in kohlrabi, and season with salt and pepper. Cook and stir until kohlrabi has softened, 3 to 4 minutes. Toss in yellow squash and continue to cook until squash is tender. Stir in the green onion, spinach, and nutmeg. Add more salt and pepper, as needed. Cook until the spinach has wilted, about 1 minute. Set mixture aside to cool. Roll out the pie crust by running a rolling pin over it once or twice. Cut out 6-inch circles using a large cookie cutter or cereal bowl – the recipe says it’ll make about 16; I got six, though I only used enough dough for a single crust. 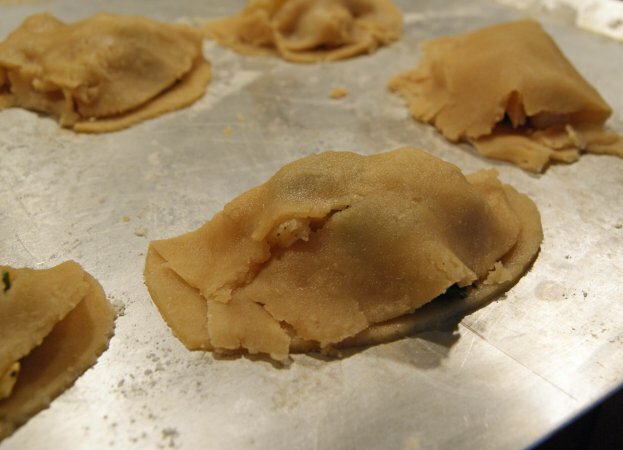 Fill the center of each circle with about 1 tablespoon of the kohlrabi mixture. 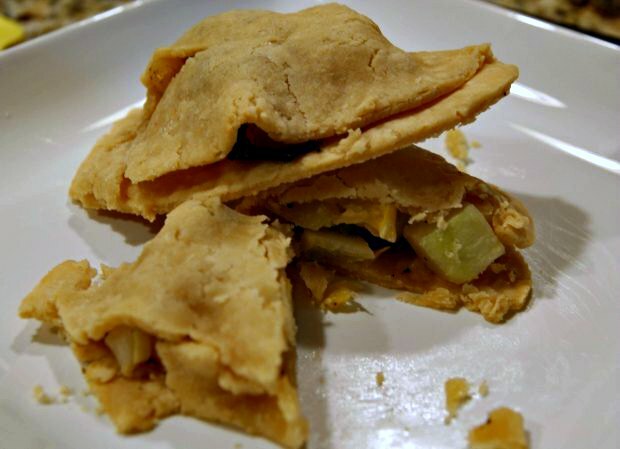 Brush the edges of the pastry with water, then fold the dough in half – this isn’t like making a calzone, which uses a nice stretchy dough; expect that the dough will fall apart a bit. Either that, or you’re better at working with pie crust than I. Crimp the edge of the dough with a fork to seal, and place on the prepared baking sheet. Bake in the preheated oven until golden brown and flaky, 7-10 minutes. Serve hot from the oven. Even C ate all of his.